Why choose Pro. Clinics for Cherry Angioma Removal? Many people will have seen small red dots that appear on the skin, but may not know the correct name for them. Cherry angioma is simply a cluster of small burst blood vessels that appear on the body and look like a small red dot. They can be flat or sometimes raised. They are not usually dangerous, but for many people, they are simply not aesthetically pleasing, so the fact that they are so quick and easy to remove is a huge relief to many people that are suffering with them. Pro. Clinics are highly skilled when it comes to removing unwanted blemishes such as cherry angioma and successfully carry out thousands of non-surgical procedures year on year. We have multiple five-star reviews on many different platforms such as Facebook, Treatwell and Google. We understand that for many people booking a non-surgical treatment can be a daunting experience, so we always take the time to answer any questions and explain the process in detail before we start the treatment. We use two methods to remove cherry angioma. The first method involves freezing the cherry angioma using liquid nitrogen, and the second method that we use involves the use of a laser. Both methods are very quick and almost painless, and people are usually in and out of the clinic in a matter of minutes. Are there any alternative treatments? E.g. apple vinegar, do they work? These little red dots are often called cherry angiomas, blood spots or ruby points. They are made up of a cluster of tiny capillaries at the surface of the skin, and can range in colour from bright red to purple. As they grow larger, they tend to expand in thickness, and may take on the raised and rounded shape of a dome and may be located on any part of the body. They usually appear in early adulthood, but the the likelihood of developing cherry angioma generally increase as one approaches their 40s. 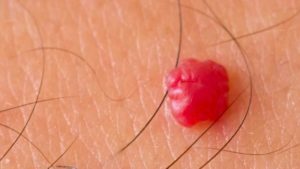 Cherry angioma are considered to be harmless, and the removal process is quick and easy using a device that freezes the blemish called a CryoPen. They often turn darker as they heal, but heal very well usually after just one treatment. There are various alternative methods such as using apple cider vinegar to remove the cherry angioma, although this can be a very slow process and results are not guaranteed. Is cherry angioma removal safe? Cryotherapy is a low-risk procedure which rapidly cools the targeted area and not the healthy surrounding tissue, meaning there are very few risks associated with the treatment. Cryotherapy involves freezing the cherry angioma with a device that sprays a fine jet of liquid nitrogen. The extreme cold will destroy the cherry angioma, and the method is known for being a quick and easy, low-risk procedure. What are the benefits of cherry angioma removal? The benefits of having a cherry angioma removed are obvious, as you will be left with clear blemish-free skin once the treated area has had time to heal. Many people do not like the look of having cherry angioma on their face or bodies, so it is a relief for them when they discover that removing them is such a quick and easy, pain-free process. After all, who wouldn’t want blemish free skin? Which parts of the body can you remove cherry angiomas from? If you have never heard of the word cherry angioma, chances are that you have probably at least seen one, whether you know it or not. Cherry angiomas are the most common type of angiomas, or benign tumors and many adults develop them either on their face or body at some point. There is evidence to suggest that by the time someone reaches 70, there is about a 70% chance that they will have multiple cherry angiomas. It is worth noting that it is much rarer for children to have cherry angiomas, with studies showing that they are observed in only around 5% of adolescents. Using a Cryopen, the cherry angioma can safely and effectively be removed from almost any area of the face or body. What is the cost of cherry angioma removal? As with all of our treatments, we try to keep our costs as low as possible. That said the cost of the liquid nitrogen canisters that we use for this procedure are fairly high, so although the treatment is incredibly quick (often only around 10 seconds) we charge £50 for the first cherry angioma and a further £5 for any additional blemishes. All treatments are subject to 20% VAT. At Pro. Clinics, we us a device called a Cryopen, which is a small pen like device that uses nitrous oxide gas ejected under high pressure on to the skin. The gas that is used is very cold which serves to freeze and destroy the cherry angioma. During the process, the tip of the CryoPen reaches -89°C. The reason for this is to create a thermal shock at the area where the gas is targeted by causing a rapid drop in temperature. The sudden temperature drop has the effect of crystallising the fluid contents of the targeted cells, therefore turning them into ice shards. This process causes the destruction of the cherry angioma. The penetration of the cold is approximately 1 mm per 5 seconds of treatment, so a 2mm sized lesion would take 10 seconds of nitrous oxide gas to treat. Cherry angioma removal using a Cryopen is a very quick and effective treatment. Each cherry angioma usually only takes around 10 seconds to freeze and 1 session is often enough. If after a couple of weeks the cherry angioma is still present, a second treatment may be required although this is unusual using this process. Cryotherapy, when used to remove cherry angiomas, is a very safe process, however there are a few side effects that you should be aware of. As is the case with many treatments, you may feel some slight discomfort while the Cryopen is being applied. The discomfort usually feels like the pressure of a pen being pressed against your skin. Generally speaking, no topical anaesthesia (or numbing cream) is required before the treatment. Another side effect is a mild stinging sensation following the procedure. Immediately after the treatment you may well experience a mild to medium stinging sensation that can last for several minutes to an hour. Again, this is nothing to worry about and the stinging sensation often does not last for long. Although rare, sores and blisters can occasionally appear where the lesion was treated. Sometimes the area can become sore, red, weepy and blistered. Sometimes a scab will form in the following days, especially where deep freezing has been required. It is very important not to scratch or pick at a scab as this could lead to scarring. The cherry angioma should be fully healed within 1 to 4 weeks and any scabs that may have formed around the lesion will shed after a week to 10 days. Pigment change is more common in darker skin types and may not be temporary. In the case of all lesions that have been treated with cryotherapy, over the next 24 hours the area will often look darker and develop a crust on the surface. Be sure not pick this off, as this could lead to scarring. When it finally, naturally falls away, you will see new skin, which is a shiny pink colour. This is not scarring and the new pigment will return over the following weeks, although it could take several months.